Neosurf is a prepaid voucher payment that facilitates quick and easy online payment, without the use of any debit or credit cards. Prepaid vouchers are a simple answer to any player unwilling to use their cards, allowing full discretion of any personal information. The use of Neosurf vouchers is fairly straightforward and requires a minimum effort to purchase and use the vouchers, allowing transactions to be quick and efficient. With thousands of sales outlets spread over 30 countries including Australia, Canada and various parts of Europe and Asia, players can simply walk into a Neosurf sales outlet and purchase vouchers of different denominations and use that voucher to pay online. 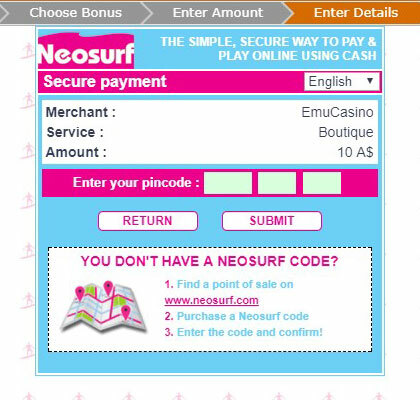 Players can now make instant deposits using Neosurf vouchers at EmuCasino on both desktop and mobile devices. Locate your closest Neosurf voucher outlet. Neosurf vouchers are now available in all major countries, in convenience stores, gas stations, kiosks, supermarkets etc. Click here to locate the outlet in your region. Simply ask for a Neosurf voucher in any of the locations. Voucher denomination can range from a minimum of $10, $15, $30, $50 upto $1,000, largely depending on the outlet area. Once the voucher is purchased, each voucher will have a unique 10 digit voucher code which is used while making an online purchase, therefore keep it secure. If the voucher is valid, your EmuCasino account will be credited instantly.